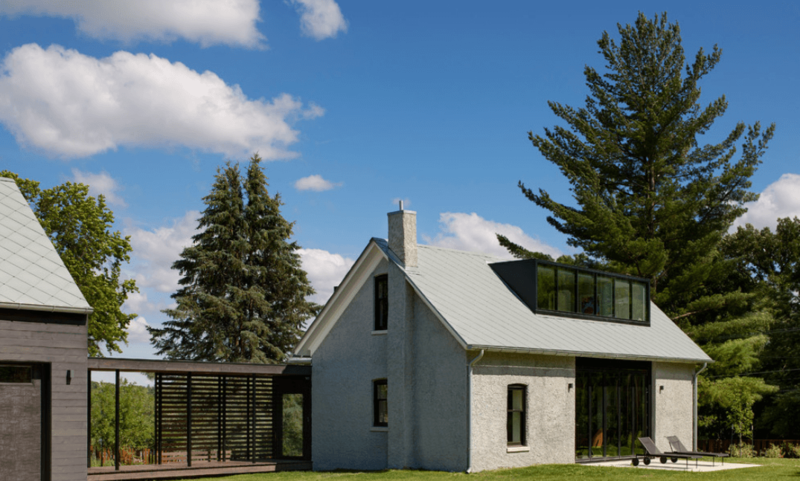 The roof of this unique home in Iowa features Diamond Flat Lock tiles fabricated by Sheet Metal Supply using RHEINZINK prePATINA Blue-Grey metal. These versatile Diamond Flat Lock Tiles were chosen because of their simple grid-like design with clean lines. The tiles feature four-way interlocking hems that allow the panels to overlap and lock into place with galvanized or stainless steel clips. Through the process of natural patination, RHEINZINK-prePATINA will, over time, produce a unique finish. As it ages and matures, a distinctive surface develops to lend buildings a timeless elegance. The PATINA LINE is always the first choice when the aesthetics of a living material is desired. It is available in three natural surfaces: prePATINA bright rolled, prePATINA blue-grey and prePATINA graphite grey. The home’s prePATINA blue-grey tiles have been pre-weathered to give the look of aged zinc. The tiles will continue to patinate and evolve in appearance over time.